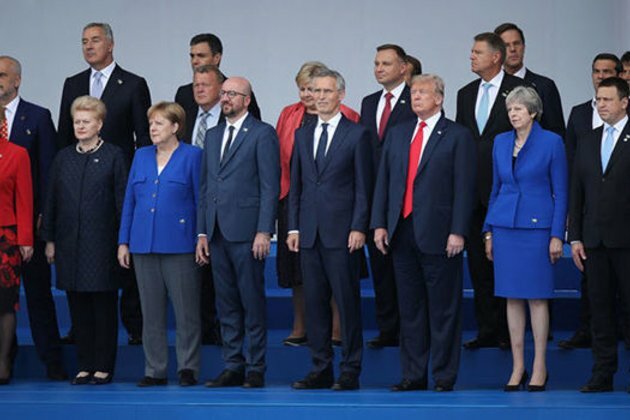 BRUSSELS, Belgium - The first day of the NATO summit, which was expected to be contentious from the start, began very much like international experts had predicted - on a confrontational note. Fresh from the U.S. President Donald Trumps criticism of some NATO members failing to reach the agreed levels of defense spending, top leaders gathered in Brussels on Wednesday morning to participate in the meeting of the world's most powerful military alliance - the North Atlantic Treaty Organization (NATO). The opening of the summit was however marked by another attack by Trump. The U.S. President greeted NATO allies with a combative opening salvo just hours after arriving in Europe. Speaking in Brussels before meeting with NATO Secretary General Jens Stoltenberg on Wednesday, Trump tore into German oil and gas deals with Russia. Accusing Germany of being controlled by the Kremlin, Trump said, Its very sad when Germany makes a massive oil and gas deal with Russia where were supposed to be guarding against Russia and Germany goes out and pays billions and billions of dollars a year to Russia. He added, Germany is totally controlled by RussiaThey will be getting between 60 and 70% of their energy from Russia and a new pipeline, and you tell me if that is appropriate because I think its not. If you look at it, Germany is a captive of Russia, because they supplythey got rid of their coal plants, got rid of their nuclear, theyre getting so much of the oil and gas from Russia. I think its something NATO has to look at. Then, Trump doubled down on his old argument that NATO countries like Germany are not meeting the alliances obligation to commit 2 percent of a countrys GDP to defense spending, calling that inappropriate also. He further added, Many countries owe us. The United States is paying far too much and other countries are not paying enough. This was Trumps second attack on NATO members defense spending in 24 hours. Before flying to Brussels, Trump took to Twitter and said, Getting ready to leave for Europe. First meeting NATO. The U.S. is spending many times more than any other country in order to protect them. Not fair to the U.S. taxpayer. On top of that we lose $151 Billion on Trade with the European Union. Charge us big Tariffs (& Barriers)! He continued, NATO countries must pay MORE, the United States must pay LESS. Very Unfair! Adding in a third tweet, Many countries in NATO, which we are expected to defend, are not only short of their current commitment of 2% (which is low), but are also delinquent for many years in payments that have not been made. Will they reimburse the U.S.? However, the U.S. Presidents startling outburst against one of Europes main military powers, shocked many and insights a stern response from Germany. Germanys Foreign Minister Heiko Maas shot back at Trumps accusation and said, We are not prisoners of Moscow or Washington. Speaking to reporters on the sidelines of the NATO summit in Brussels, Maas said, We are not prisoners, neither of Russia nor of the United States. We are one of the guarantors of the free world and that will stay that way. He further added that Berlin plans an increase in defense spending of 80 percent by 2024. Maas pointed out that the increase is of such a magnitude that it should be recognized. German Chancellor Angela Merkel too delivered a pointed response to Trump and said that Germany was independent in its policy choices. Soon after arriving in Brussels, Merkel responded to Trumps tirade over German imports of Russian gas and its slowness to increase defense spending and said, I have experienced myself how a part of Germany was controlled by the Soviet Union. She added, I am very happy that today we are united in freedom, the Federal Republic of Germany. Because of that we can say that we can make our independent policies and make independent decisions. That is very good, especially for people in eastern Germany. Further, defending Germanys contribution to the NATO alliance, which Trump has said has placed too much burden on the U.S. taxpayer, Merkel said, Germany does a lot for NATO. She pointed out, Germany is the second largest provider of troops, the largest part of our military capacity is offered to NATO and until today we have a strong engagement toward Afghanistan. In that we also defend the interests of the United States. Later in the day, Trump reportedly told NATO Secretary-General Jens Stoltenberg that Germany was wrong to support a new $11-billion Baltic Sea pipeline to import Russian gas while being slow to meet targets for NATO spending to protect against Russia. At a pre-summit meeting at the residence of the U.S. ambassador to Belgium, Trump told Stoltenberg, aware that reporters were present there, Were supposed to be guarding against Russia and Germany goes out and pays billions and billions of dollars a year to Russia. Later, holding a meeting with Merkel on the sidelines of the summit, Trump said that he had a very, very good relationship with Merkel, who described the two as good partners. Later, Stoltenberg told reporters that Trump had used very direct language but that all NATO allies were agreed that the cost of defense spending must be spread around. He further pointed out that last year had seen the biggest increase in a generation. He also frankly spoke about the impact of Trumps criticism on the Western allies at a broader level and said, There are disagreements on trade. This is serious. My task is to try to minimize the negative impact on NATO. So far it hasnt impacted on NATO that much. I cannot guarantee that that will not be the case in the future. The transatlantic bond is not one, there are many ties, some of them have been weakened. Trump is due to attend the second day of the summit on Thursday, before leaving to the U.K. for a four-day visit, where he will hold meetings with the British Prime Minister Theresa May and Queen Elizabeth. He will then fly to Helsinki, Finland, for his first summit with the Russian president Vladimir Putin.